A vibrant community of woman farmers, millers, and bakers is on the rise (pun intended!) in California. 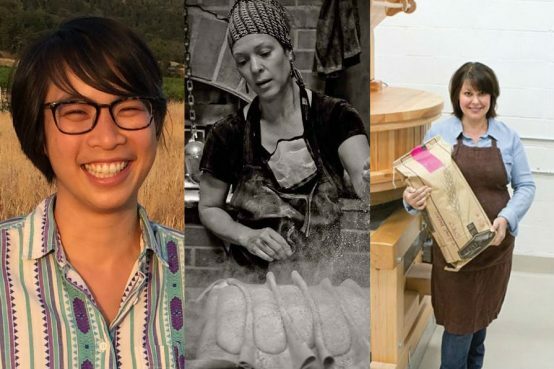 We’ll be welcoming three of them to SHED for a conversation about how we can restore regional grain economies, create more resilient woman-owned businesses through collaboration and community-building, and bake more delicious and nutritious bread. Our own Cindy Daniel will guide the conversation as we share knowledge, resources, and inspiration centered around good farming and good baking. Tickets are pay-what-you-can; no one will be turned away for lack of funds. Email eventsmanager@healdsburgshed.com if you have any questions. Mai Nguyen is a grain farmer, co-owner of Sonoma Grain Collaborative, and co-founder of the California Grain Campaign. Nguyen grows rare, heirloom varieties of wheat, barley, and millet for food and seed using natural farming practices. They collaborate with millers and bakers to create a new grain economy centered on labor, health, and the environment. Nguyen is a 2018 Grist 50 Fixer and 2018 Berkeley Food Institute Changemaker. Nan Kohler is the owner and miller at Grist & Toll, Los Angeles’ first urban flour mill in almost 100 years. Milling in small batches on an authentic stone mill, she is re-introducing the craft of milling to provide local bakers with fresh flour of exceptional flavor, aroma, and nutritional value. She sources her wheat and grains from like-minded farmers, dedicated to sustainability and transparency. Her goal is not to revive an old-fashioned approach, rather it is to showcase the beauty and diversity of grain, which we have lost, and to put it back where she knows it belongs – on the cutting edge of culinary discovery. Celine Underwood is a baker and the founder of Brickmaiden Breads in Point Reyes. Brickmaiden Breads is community-centered—they aim to provide quality baked goods for their neighbors, support local producers and businesses, and compensate staff with a living wage. They focus on environmental stewardship, including waste reduction and use of sustainable local firewood in their bread ovens. Brickmaiden has been successful in remaining a low-impact business and will continue to strive for that goal. Their greatest pride is having a face-to-face relationship with their community. Following the event, Honoré Farm and Mill’s mobile grain mill will be parked outside SHED for a milling demonstration and tasting starting at 2:30.